Immerse yourself in thrill-a-minute Midtown Manhattan and enjoy a boutique oasis where you can unwind and exchange *only in New York* stories. 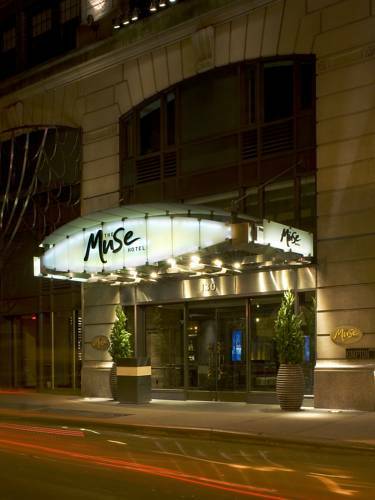 Welcome to The Kimpton Muse Hotel just steps away from world-famous shopping sightseeing museums theater and nightlife. Although we arere buzzing with energy and lively banter our newly renovated ambience brings your adrenaline level down a notch with a relaxing contemporary vibe. Bring your family your pet or your business agenda and lets do New York. The excitement of Midtown Manhattan surrounds The Muse Hotel. Located in the heart of the New York Theater District hotel guests are within easy walking distance of Broadway and Manhattans most popular arts and attractions are just steps away-think Times Square; Broadway theaters; Rockefeller Center; Radio City Music Hall; Carnegie Hall; Bryant Park; the New York Public Library and the Museum of Modern Art. Divisible into two rooms, the Olympus Room can be set up to accommodate a variety of events ranging in size from 4 to 100 guests. The Bacchus Room, 200 square feet in size, features an expansive wine display wall and state of the art technology. This room creates an elegant backdrop for a meeting or could be used as a private dining room for an intimate party of up to 12 guests.